I have written before about what I consider to be a true Massachusetts Miracle: The 1992 reform of the Commonwealth’s workers’ compensation system and the results achieved following that reform. Bottom line – premium rates in Massachusetts are among the lowest in the nation while benefits are among the highest. To make that happen back in 1992 all of the varying and vested constituencies had to come together and enter a grand compromise where everyone lost something so that the system could flourish as it has ever since (I won’t bother to mention that the current crop of folks we Americans have sent to the nation’s capital might learn something from this). The decision will also cost the Commonwealth’s insurers the same $175 million. Now, there are many variables impacting premium rates in any state. For example, workers compensation medical loss costs have been rising in Massachusetts. Just a couple of years ago they comprised an enviable 36% of total loss costs; now they’re up to about 40%, and rising. But I thought perhaps I could put things in perspective if I just looked at the Massachusetts evolutionary development of a few key factors since the 1992 reforms. And those factors would be workers compensation premium rate changes, wage development and the progression of the CPI. The data in the chart below is taken from the Bureau of Labor Statistics, the Massachusetts Division of Unemployment Assistance and the Massachusetts Department of Industrial Accidents (DIA), summarized in the Massachusetts Division of Insurance’s Annual Report of 2010 (PDF) and DIA Circular Letter 336, dated 6 October 2010 (PDF). 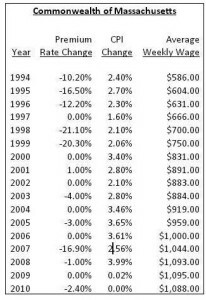 In the 17 years since 1994, there have been six years with double digit rate reductions, the largest being 21.1% in 1998, five years with single digit reductions, ranging from 1% to 4%, five years without change, and one year with a whopping big rate increase of 1%. The result is that rates in Massachusetts are where they were in the early 1980s. One by-product of this situation is that many Massachusetts employers seem to have lost the sense of urgency when injuries occur. On the other hand, the CPI has increased every year since 1994 with the exception of 2010, when there was no change (it’s interesting to compare the CPI development with periods of recession; look at 2009 and 2010, for example), and the average weekly wage in the Commonwealth has grown from $586 in 1994 to $1,088 in 2010 (in 2012, it’s now more than $1,100). The result shows a steady increase in costs and a steady decline in rates. 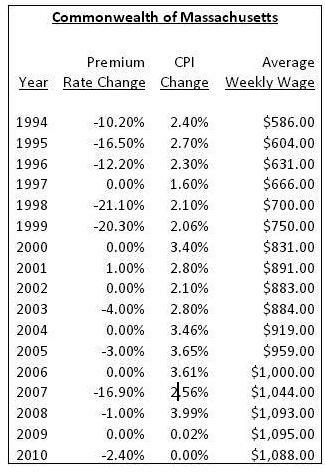 I have to say that the reductions from 1994 through 1999 were entirely appropriate; those are the result of the 1992 reform. However, the six years with reductions since then, totally 28.3%, are questionable. The consequences of both Commissioner Murphy’s current decision as well as the recent reductions are now being felt. The Massachusetts Assigned Risk Pool is growing quickly; in the last year it’s jumped from 12% of the market to 15% ($152 million in premium), and that was before the decision of two weeks ago. It would not surprise me to see Pool growth accelerate in the immediate future. You can only keep the pressure cooker’s lid on for so long. Are Comp Rates Finally Trending Upward? For over a decade, workers comp insurers have watched profit margins erode, as rates in many states continue their precipitous fall. The mismatch between premiums collected and losses paid out has reached alarming levels, with a projected combined ratio of 121.5 percent for the current year. Even in the best of times for investments, making up 21 percent against losses would be daunting, and these are hardly the best times for money to make money. The ever-reliable Roberto Ceniceros writes in Business Insurance that the long-awaited upward trend in rates for comp insurance appears to be underway. Among the 38 states directly administered by NCCI, there are requests for modest rate increases in 19; given that the insurance cycle runs from July to June, we can expect to see more states with rate increase requests over the next 9 months. The increases are by no means dramatic (and, some would argue, hardly adequate when measured against insurer losses). The rate increases proposed by NCCI all fall within single digits. When contemplating the problems of insurance companies, we must never lose sight of the tendency, as my colleague Tom Lynch puts it, of “insurers eating their young” – in other words, despite the losses, insurance companies persist in offering steep premium discounts, leading state regulators to conclude that they don’t really need rate reductions. Insurers continue to hope that their underwriters have a magic touch in finding the good risks and avoiding the bad. With margins as tight as they are, finding a profitable book of business becomes increasingly unlikely, no matter how skilled the underwriting. A.M. Best projects the short term prospects for comp carriers to be “grim.” That is no overstatement. State regulators tend to be slow to respond to requests for higher comp rates. Employers are already struggling in a bad economy and regulators will do everything possible to keep comp costs as low as possible. While the long-term trend of lower rates may finally be nearing an end, the upturn is likely to fall short of what is needed. These are tough times for comp carriers, with no significant relief in sight. Posted in Industry Events, Insurance & Insurers | Comments Off on Are Comp Rates Finally Trending Upward?